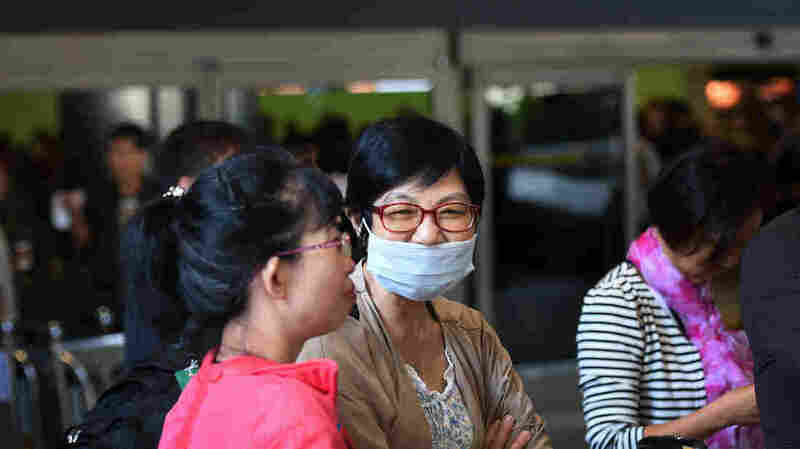 Poll: Broad Support In U.S. For Ebola Travel Ban : Shots - Health News An NPR poll finds a majority of Americans are worried about Ebola. Fifty-six percent of people are either "very concerned" or "somewhat concerned" about the spread of the Ebola virus to the U.S.
A passenger wearing a face mask arrives at Los Angeles International Airport Friday. Federal officials now require people traveling from West Africa to enter the U.S. at one of five airports equipped to screen them for signs of Ebola. 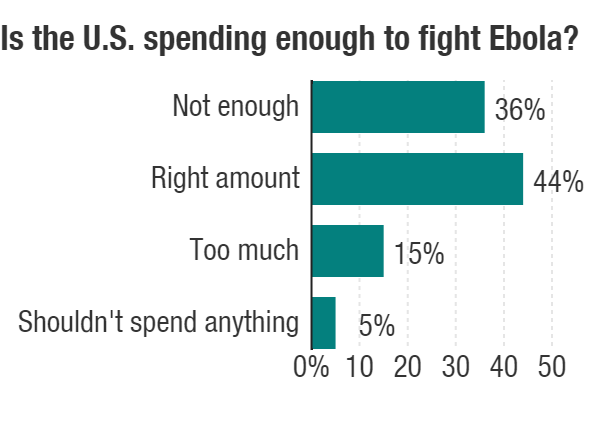 A majority of Americans are worried about Ebola. Fifty-six percent of people are either "very concerned" or "somewhat concerned" about the spread of the Ebola virus to this country. The level of worry "is a little lower than I would have guessed given the media play over the last several weeks," Dr. Michael Taylor, Truven's chief medical officer, tells Shots. He says there's no reason for panic. "The big concern is that if it can't be managed in Africa it's going to spread," he says. People were split pretty evenly on whether the U.S. response has been adequate: 49 percent said yes; 51 percent said no. About three-quarters of people aware of the Ebola outbreak say the U.S. should take steps such as banning travel to and from the affected part of Africa. Things got a little more complicated when we asked whether U.S. citizens who become infected with Ebola while performing humanitarian work should be brought back to this country for treatment. Overall, 40 percent of people oppose that idea; 60 percent are in favor. But sentiment varied quite a bit by age, education and income. There is support for bringing people back for treatment among nearly three-quarters of people who are 65 or older, have at least a college degree or whose annual household income is $100,000 or more. Among people under 35, there is an even split on whether infected people should be brought to the U.S. for treatment. While the poll questions were in the field, Thomas Eric Duncan became the first person to die from Ebola in the U.S. and less than a week later Nina Pham, a nurse who helped care for Duncan, became the first person to become infected with Ebola in this country. We asked while events were unfolding how Americans see the country's preparedness? A slim majority — 51 percent — believe the U.S. health care system has the resources and trained personnel to deal with Ebola here. The poll's margin for error is plus or minus 1.8 percentage points. The full results, including the text of the questions, can be found here.